www.trinityatl.org/summercamp For more information, please contact Kayleen Whitmer at kwhitmer@trinityatl.org or 404-231-8117. Coding Academy 201 Rising Secondâ&#x20AC;&#x201C;Fifth Grade Campers will play, learn, explore, and develop their coding skills in Coding Academy 201. Coding has multiple benefits, from improving problemsolving techniques, collaboration, communication, and breaking down big ideas to specific tasks, using logic, and showing perseverance. Campers will engage in coding with Spheros, Blue-Bots, Bloxels, Kodable, and so many other fun state-of-the-art tools. Your child will leave camp feeling empowered and confident in coding. Girls In Action Rising Thirdâ&#x20AC;&#x201C;Sixth Grade Campers will spend a week with Girls In Action getting healthy and having fun! Our Girls in Action will stay moving with activities like running the track, playing games, and exploring in Discovery Woods. They will also sample a fun and healthy snack each day. Trinity Spirit Camp Rising Kindergarten–Third Grade Campers will enjoy a week of fun with Ms. Ali and Ms. Molly showing their Trinity spirit! As former cheerleaders and coaches, Ali and Molly are excited to share their passion for cheer and dance. Participants will learn fundamental skills, including motions, form, and stunts. Parents are invited to attend the pep rally on the last day of camp where campers will perform a cheer and a dance! Vet Academy: Basic Vet Skills Rising Second–Fifth Grade Does your child love animals? Want to be a vet when they grow up? Then Vet Academy is the place for them! Campers will join Trinity School Science Teacher Lauren Kane to become junior veterinarians this summer! They will learn what vets do, where they work, and how they help animals. Using stethoscopes and microscopes, campers will dissect an owl pellet, practice their suturing skills, examine x-rays, and learn from other animal-lovers in our Atlanta community! Junior Vets will also adopt their own dog or cat, design carriers and collars, and learn how to conduct physical exams and splint sprained bones. Vet Academy will include playground time, arts and crafts, and games. It will be a paws-itively great week! Campers are welcome to register for both sessions of Vet Academy: “Basic Vet Skills” (Session 1) and “All About Animals” (Session 2). Both camps will also be offered during Sessions 3 and 4. Wilderness Wonders: Creek Wonders Rising Pre-K–Second Grade Does your child ever wonder where the creek in Discovery Woods goes? Or even where it begins and ends? What lives in water? Campers will wade through the creek’s meandering path as we discover the answers! Join Ms. Pam and Ms. Brooke for a week of fun! Young Chefs Rising Third–Sixth Grade Young Chefs will prepare delicious, homemade treats, such as salsa and quesadillas, peach cobbler, and pizza. They will learn kitchen safety and cleanliness as well as basic kitchen skills, such as whipping, baking, roasting, sautéing, measuring, and following a recipe. Young Chefs will not only enjoy yummy eats, but also leave with cooking knowledge and kitchen confidence. Each week of camp will provide new recipes and experiences! Activities in the Afternoon: 12–2 PM Rising Pre-K–Sixth Grade Campers should get ready for an afternoon of fun! Every day, lunch, playground time, and an activity await them. This camp is for campers who are participating in a Special Interest Camp and want to stay until 2 PM. Session 2 | June 10–14 Atlanta Sports Camps Rising First–Sixth Grade Coach Brian and his staff have created a safe and challenging environment for both boys and girls. Our goal is for all campers to play hard, display sportsmanship, and have fun! The day will be filled with your kids’ favorite sports activities: soccer, kickball, tag and capture-games, basketball, flag football, hockey, lacrosse, ultimate Frisbee, cooperative challenges, and more. Campers will have the opportunity to swim at Garden Hills Pool and participate in water activities on Trinity’s campus. Lunch, swimming, and transportation to and from Garden Hills are included. Cool Kids Code 101 Rising Kindergarten and First Grade Campers will be introduced to coding and will play, learn, explore, and develop their coding skills. Coding has multiple benefits, from improving problemsolving techniques, collaboration, and communication to breaking down big ideas to specific tasks, using logic, and showing perseverance. Campers will engage in coding by exploring multiple coding apps and code using Blue-Bots. By the end of the week, they will feel empowered and confident in their coding. Multiplication Mania with Mrs. Coote Rising Third and Fourth Grade Does your child need a jump start on learning or strengthening multiplication and division skills? Campers will learn various multiplication and division strategies while gaining an understanding of algebraic concepts. They will engage in fun activities to problem solve while working individually and in groups. Miss Kimberly’s Disney Extravaganza Rising Pre-K–First Grade Campers will join Miss Kimberly for a week full of creating fabulous crafts and participating in fun activities based on favorite Disney movies like Finding Dory, Toy Story, The Lion King, Winnie the Pooh, and Cars. Each day will have a different theme! Storybook Art: The Wild Side of Design Rising Pre-K–First Grade Let your child learn to love literacy by creating art! Trinity Teachers Claire Cagle and Anne Jones will integrate literacy skills using different picture books while exploring different art media. Throughout the week, campers will learn all about creatures in the wild, including lions, monkeys, and even snakes! By the end of the week, your child will learn how to create art pieces that tell a story and write words that paint pictures! Super Scientists: More Fizz, Pop, Bang...Kid Chemistry! Rising Pre-K–First Grade Can’t get enough Fizz, Pop, Bang? Campers can come back for more cool-kid chemistry with Trinity Teachers April Patton and Thalia Scott. During this second week of exploring in the science lab, campers will conquer STEAM challenges and investigate how heat affects a variety of materials. They will explore chemical reactions while erupting mini volcanoes and getting creative with exploding sidewalk chalk! Our Super Scientists will experiment, explore, and discover...that science is a blast! Session 1 of Super Scientists is not a prerequisite for Session 2. Campers can attend either or both sessions. Wilderness Wonders: The Enchanted World of Fairies Rising Pre-K–Second Grade Campers will delve into the magical world of fairies with Ms. Pam and Ms. Brooke. They will look under leaves, feel the soft moss, create their own little houses, and see if they can catch a fairy! Young Chefs Rising Third–Sixth Grade Young Chefs will prepare delicious, homemade treats, such as salsa and quesadillas, peach cobbler, and pizza. They will learn kitchen safety and cleanliness as well as basic kitchen skills, such as whipping, baking, roasting, sautéing, measuring, and following a recipe. Young Chefs will not only enjoy yummy eats, but also leave with cooking knowledge and kitchen confidence. Each week of camp will provide new recipes and experiences! Activities in the Afternoon: 12–2 PM Rising Pre-K–Sixth Grade Campers should get ready for an afternoon of fun! Every day, lunch, playground time, and an activity await them. This camp is for campers who are participating in a Special Interest Camp and want to stay until 2 PM. Girls In Action Rising Kindergarten–Second Grade Campers will spend a week with Girls In Action getting healthy and having fun! Our Girls in Action will stay moving with activities like running the track, playing games, and exploring in Discovery Woods. Campers will also sample a fun and healthy snack each day. Swing Into Fifth and Sixth Grade Math with Mrs. Coote Rising Fifth and Sixth Grade Has your child been waiting to learn all about algebraic reasoning and how to write algebraic equations? Then this is the camp for them! Through fun individual and group activities, campers will learn and strengthen skills in addition, subtraction, multiplication, and division of decimals, fractions, and percentages while gaining an understanding of algebra. They will learn to solve equations and inequalities, work on geometric shapes, and coordinate geometry. Vet Academy: All About Animals Rising Second–Fifth Grade Does your child love animals? Want to be a vet when they grow up? Then Vet Academy is the place for them! Campers will join Trinity School Science Teacher Lauren Kane to become junior veterinarians this summer! Junior Vets will not only learn about the needs and adaptations of animals, but they will design animal habitats, adopt their own cat or dog, and meet other animal-lovers who work in our Atlanta community! Campers can look forward to different animal-themed days where they will learn all about a variety of critters, conduct science experiments, and complete STEAM challenges! Vet Academy will include playground time, arts and crafts, and games. It will be a paws-itively great week! Campers are welcome to register for both sessions of Vet Academy: “Basic Vet Skills” (Session 3) and “All About Animals” (Session 4). Wilderness Wonders: Sticks & Stones Rising Pre-K–Second Grade Can we make art from sticks and stones? Can they be painted, glued, stacked? Ever hear of a pet rock or see a hanging mobile made from nature? Campers will put their imagination to work as they discover what treasures can be found and created in Discovery Woods with Ms. Pam and Ms. Brooke. Activities in the Afternoon: 12–2 PM Rising Pre-K–Sixth Grade Campers should get ready for an afternoon of fun! Every day, lunch, playground time, and an activity await them. This camp is for campers who are participating in a Special Interest Camp and want to stay until 2 PM. Session 5 | July 29–August 2 Breaking Barriers Baseball Camp Rising Kindergarten–Sixth Grade Your child will gain a solid foundation of baseball skills during a camp led by former Chicago Cubs outfielder C.J. Stewart and student-athletes from public high schools around Atlanta who participate in Stewart’s L.E.A.D. Ambassadors program. Campers will be taught the fundamentals of base running, fielding, and throwing while, most importantly, having fun! All skill levels are welcome. Ease Into Early Learners! 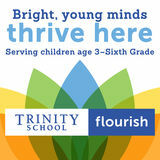 Rising Early Learners* Welcome to Trinity School, new Early Learners! Campers will join Ms. Gale and Ms. Robin for lots of learning and laughing. They will read stories, sing silly songs, and play games, all while practicing important skills and becoming acclimated to the daily routine of a Trinity School Early Learner. We will also enjoy exploring the School’s beautiful campus, including Discovery Woods. 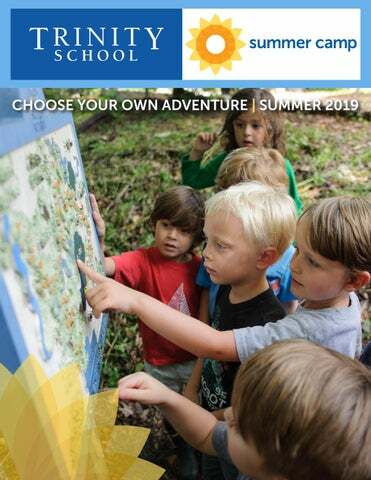 *Please note that this camp is only for children accepted into the Trinity School Early Learners program for the 2019-20 school year. Jump Into Kindergarten! Rising Kindergarten Campers will have fun with Ms. Shaun and Ms. Megan as they deepen foundational skills through the routines and strategies of Reader’s and Writer’s Workshop. From mini-lessons to individual conferencing (and so much more! ), your future Kindergartner will receive a sneak peek of the structure, play, and fun of a typical Kindergarten day. Welcome to Kindergarten! summer camp Registration opens to the public January 31 www.trinityatl.org/summercamp For more information, please contact Kayleen Whitmer at kwhitmer@trinityatl.org or 404-231-8117. Please visit www.trinityatl.org/summercamp for more information and to register for Trinity School Summer Camp!